New to the market is this stylish premium gin from Mourne Dew Distillery which is located in the next town over from us here in the Mournes. 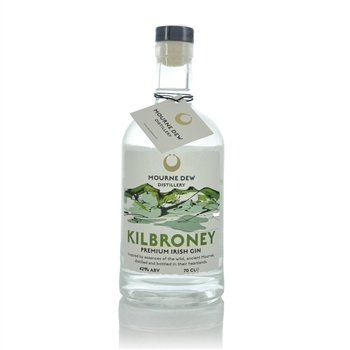 In September 2018 Mourne Dew launched their Kilbroney; a premium Irish gin, followed by a flavoured, Ruby Irish Gin. We hand produce everything on site; from distillation and bottling to labelling & packaging. The beautiful label artwork is designed by well known, successful Irish artist Kathyrn Callaghan. The label captures the wild heartland where we find our home, and what inspires us to do what we do. Our logo takes its inspiration from Bronze Age Gold Lunulas (neck collars) which are believed to have been made using gold from the Mourne Mountains. Inspired by our surroundings, we have captured the very essence of the Mournes; employing the help of an ethnobotanist, who scours the mountains, foraging local edible botanicals. This has allowed us to build up a library of very special tinctures using a low temperature, vacuum distillation process to gently extract the flavours from the delicate flora. Some are contained in the initial offerings and many more will be incorporated in new spiritous beverages which will be available in the coming months and years. On the nose: fresh, uplifting citrus that’s followed by elegant, rounded floral tones. On the palate: delicate juniper notes that are beautifully complemented by hints of both spice and citrus. The finish: long and complex, made possible by a fusion of sweet florals and light herbal flavours. Bought it because it was new, wasn't sure what to expect to be honest, but wow it's SO good. The citrus aroma isnt overwhelming but just right - I've already bought a second bottle!